Friday, Saturday, Sunday: 11am – 6pm. We’re located at 4615 Remount Rd, Front Royal, VA 22630, just a few minutes off of Route 66. Let us know in advance if your large party is planning to visit our tasting room. 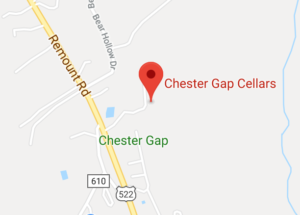 For groups larger than 6, please make a reservation either via email: info@chestergapcellars.com or phone call: (540) 636-8086. Thank you for your consideration.